The city’s Historic District Landmarks Commission has repeatedly cited the building’s owner, the Greater St. Stephen Full Gospel Baptist Church, for demolition by neglect. Greater St. Stephen is now at risk of paying a $500 a day fine if restoration does not begin in 30 days. PJ Morton — the son of Greater St. Stephen pastors the Rev. Debra B. Morton and Bishop Paul S. Morton — said he wants to turn the buildings into a museum that honors Bolden’s legacy and a space to educate New Orleans musicians in the business of producing and licensing recordings. Morton is working with Sundiata Marcelin of Marcelin Engineering to draw up plans for the buildings’ stabilization and renovation, said the PRC, which is advising Morton on preservation best practices and possible financing mechanisms. City records show the building has continued to deteriorate despite notices for code violations and demolition by neglect. A 2017 inspection found six violations; the most recent inspection on record, in May 2018, listed 10 open violations. 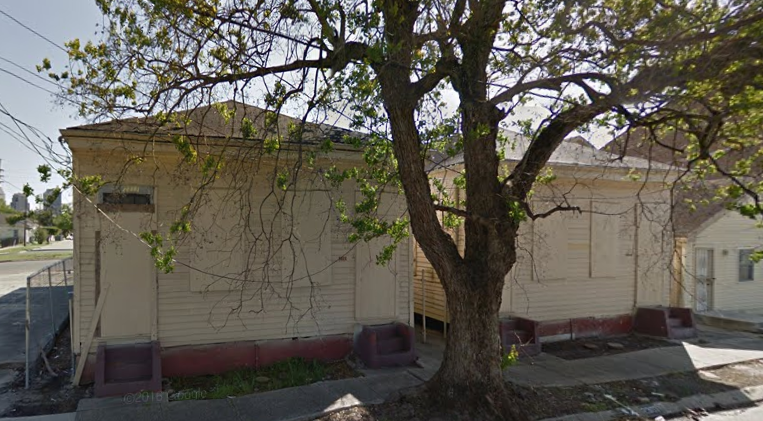 Greater St. Stephen purchased the Bolden house and its neighbor for $80,000 in April 2008, according to Orleans Parish Assessor’s Office records. The First Street shotguns were near the original St. Stephen church at 2308 S. Liberty St. in Central City. A few months after the traditional shotguns were in St. Stephen’s hands, in July 2008, the Liberty Street church was gutted in a fire. At that time, a second St. Stephen church in New Orleans East was under renovation after flooding in the Katrina levee breaches, a 2008 Times-Picayune story states. When the renovation was completed, the megachurch moved to the Read Boulevard campus, where it flourishes with about 10,000 members, according to the Hartford Institute’s database of Protestant and Evangelical churches. By 2011, the Bolden house had made the Louisiana Landmarks Society’s list of New Orleans’ Nine Most Endangered Sites. But it still drew, and continues to draw, jazz pilgrims from all over the world, who come to pay homage to the birthplace of jazz. Buddy Bolden, a cornet player and leader in the city’s turn-of-the-century dance bands, was a key influence in the origin and development of jazz. He is known for infusing ragtime, the popular music of his day, with an earthier, looser blues and for his pioneering improvisational skills. WWOZ’s “A Closer Walk” website on the history of New Orleans music notes that Bolden and other early jazz artists from Central City, including King Oliver and Kid Ory, used rhythms that were influenced by the black Protestant church, in contrast to the Creole Catholic influence in the downtown neighborhoods. Bolden is also credited with an innovation in syncopated rhythm that allows more room for improvisation. PJ Morton, the Maroon 5 keyboardist and a solo artist, won the 2019 Grammy for Best Traditional R&B Performance, his ninth nomination. His father, Paul S. Morton, is well known as a gospel singer as well as a preacher and church leader.